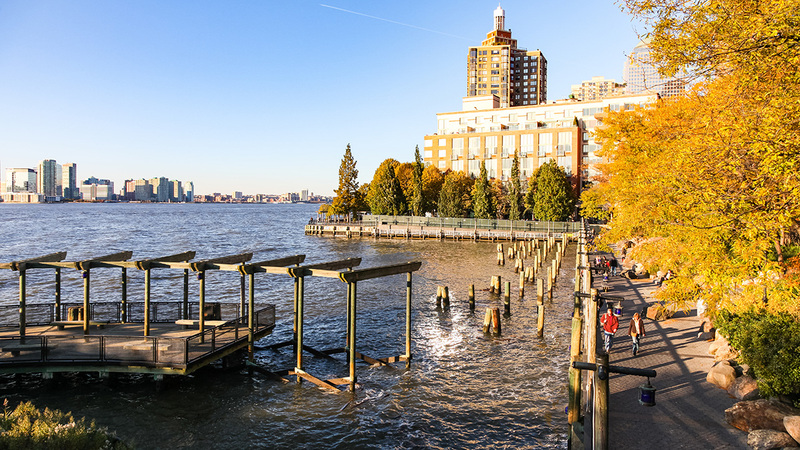 Among Battery Park City’s numerous parks, this multi-level waterfront site offers unique second-story views of the Hudson River and the rare chance to feel its tides at one’s feet. 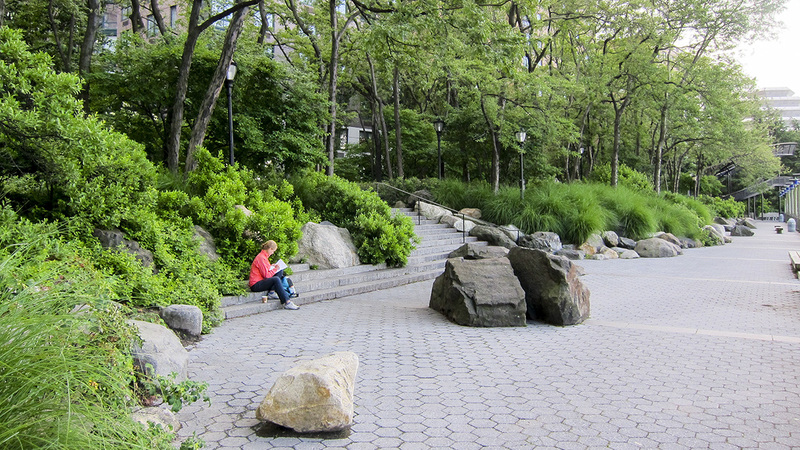 In 1984, The Battery Park City Authority hired landscape architects Child Associates (Susan Child and Douglas Reed), architect Stan Eckstut of Cooper Robertson Eckstut, and artist Mary Miss to build a park on a concrete platform above a landfill. They developed the concept of a cove with a visibly constructed edge, completing the project in 1987. 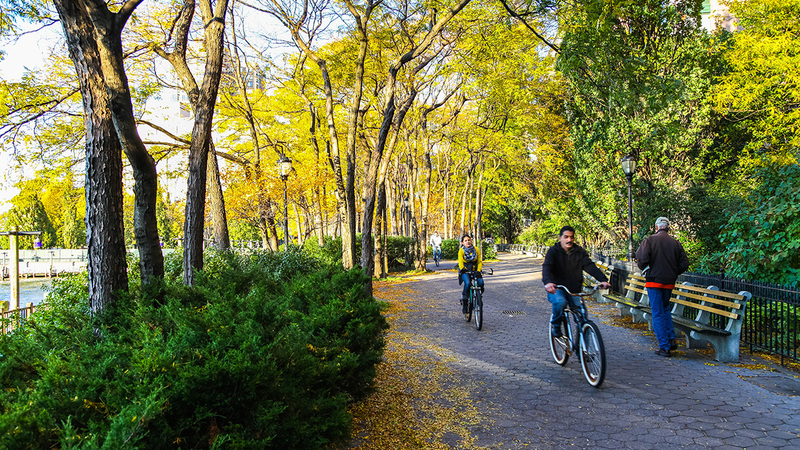 The 3 ½-acre site mediates the topographical transition from city to river with a forested hillside planted on imported soil with linear swaths of honey locusts and native seaside vegetation, mimicking natural coves of the Northeast. 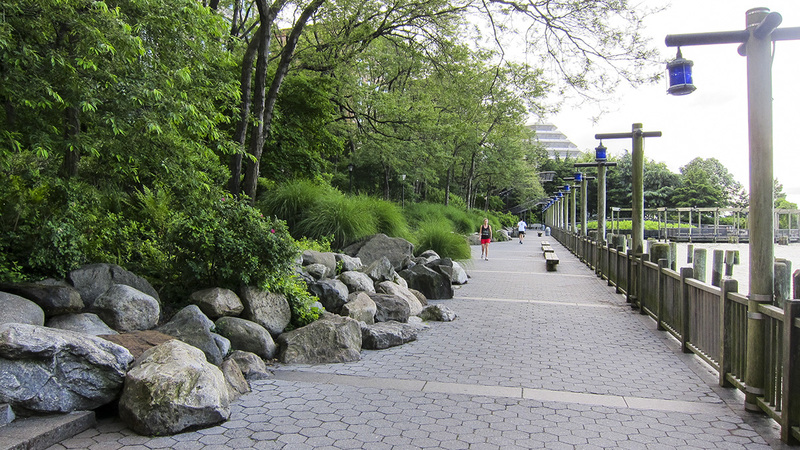 Boulders along the hillside lead down to The Esplanade, which runs the length of the Battery Park City waterfront. 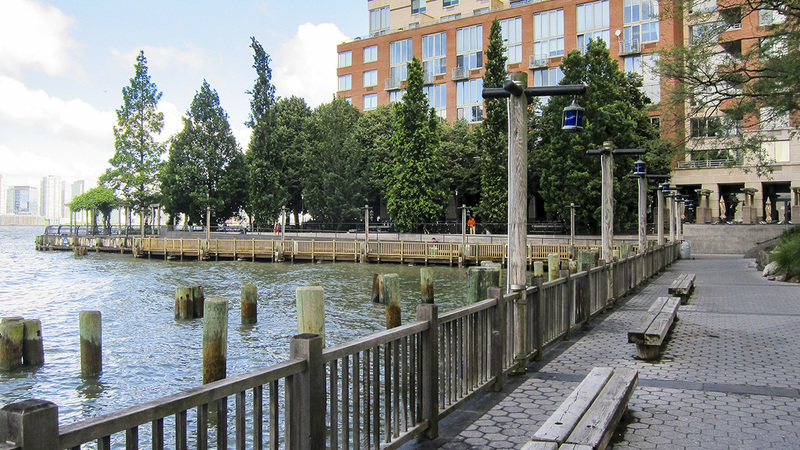 Referencing New York’s port heritage, blue ships’ lanterns hung on wooden lampposts line the Cove’s portion of The Esplanade and shimmer on the water at night. Wood pilings submerged in the river, the remnants of lost piers, continue the historical reference while drawing attention to the subsurface structure supporting the concrete cove. 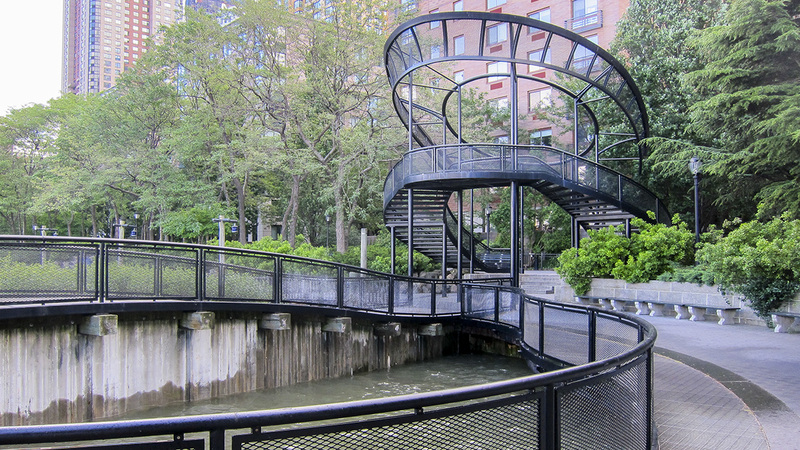 South Cove was designed as a series of vertically layered spaces from which to explore the relationship between city and river’s edge. 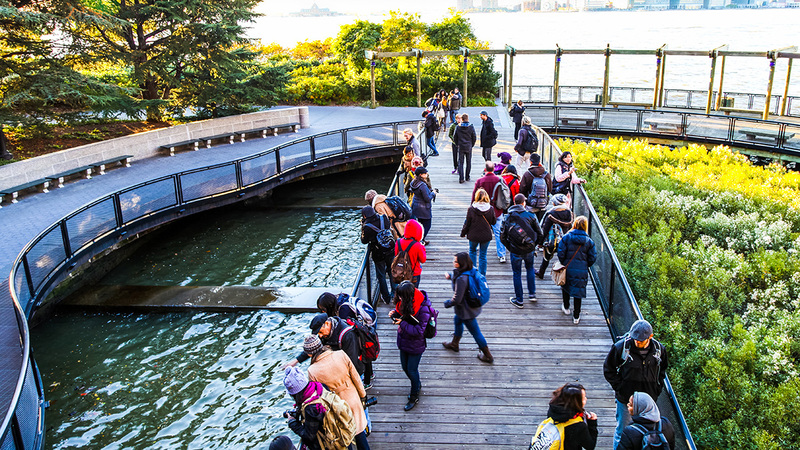 Miss’ site-specific installation, the form of which references the crown of the Statue of Liberty, leads visitors up an arched stairway offering sweeping views of the harbor. 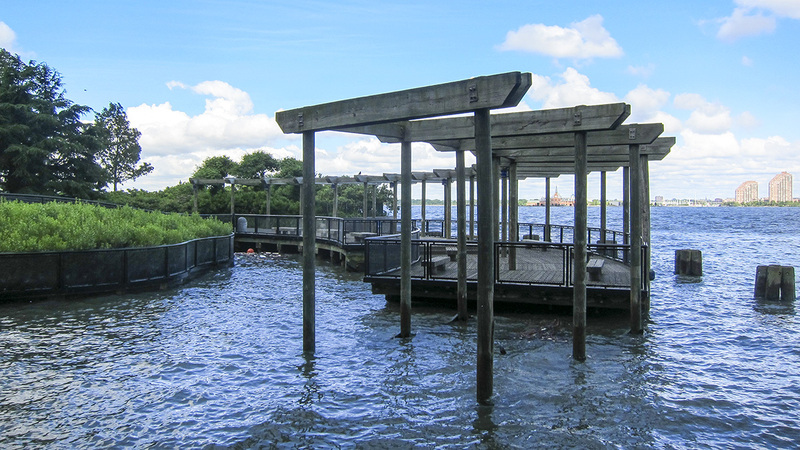 Entering the site from the north, The Esplanade wraps around through a grove of honey locusts at grade, while a second path gradually angles downward, leading to the water by way of a curved and wooden trellis-sheltered pier, which becomes partially submerged at high tide.